We arrived on Friday morning ready for another busy day ahead. The day started with our usual devotions and team time, followed by setting up for our family fun day. We had many different stalls such as inflatables, face painting, penalty shoot out, whack the rat, hoop throw, slushies and much more for our pea fair. The crowds started arriving at 10am with a total of 58 children and 24 adults. Everyone fully enjoyed a morning of fun activities despite a few showers of rain. The fun day was finished off by a re-cap on the weeks talks by Joel Loughridge. The team had lunch and a power nap before starting an afternoon of studying the topic of prayer led by Peter Dundee. We looked at the Lord’s Prayer and spent time thanking God for how well the week had gone, praying for the children and pensioners we had met during the week’s activities and praying for ourselves. Even though the Go Team were weary from their busy week everyone managed to stay awake and learn much from Peter’s seminar. After our discussion we had a quick turn around to grab dinner and get on the bus with the teens to head to Ballypatrick forest just outside Ballycastle for an evening of team games. We played a variety of games such as capture the flag and scavenger hunt. There were a few scraped and bruised legs but everyone thoroughly enjoyed their evening. We finished off the trip by going to the sea front and getting a chippy. This was a great end to teens club and resulted in some great conversations on the bus between the Go Team members and teens of Cloughmills. The Go Team spent the rest of the evening at the Forgrave’s roasting marshmallows on the fire pit and gazing at the stars in the clear sky above. To finish off the week, the Go Team all met for one final time and went out for breakfast in a local restaurant. After everyone was stuffed from their delicious fry, they said their goodbyes and went on their way home. We’re thankful for God having blessed our week in the numbers we’ve had at all the events, good weather, safety, how the team have worked well together and how he has blessed each team member by drawing them closer to him and teaching them new truths from his word. As a congregation we are very thankful to have this opportunity to have this concentrated week of outreach in reaching out to the community and building further relations with those who live in it and sharing the gospel with them. We pray that God will bless the work that we are doing for him in furthering his kingdom. The team made it through a day packed with activities admirably. We were happy to have another full house at the morning's Holiday Bible Club, with around 50 children again. Andrea led the talk, today "gathering evidence" about sin from Bible verses. We tweaked the groups for this part to keep the kids with others of the same age, and it seemed to help their ability to keep up. The spy kids enjoyed making espionage-related crafts, maneuvering through a course of laser-like yarn, and watching Ieuan and John, our special agent guests, compete to determine the best spy. Next we had to quickly prepare for the Pensioners Tea Party, which featured a wide range of acts this year, including Lauren and Abigail Forgrave singing, Jess performing a jig on fiddle, and Ieuan serenading the audience of about 40 on guitar. As a grand finale, the entire team performed "Bridge Over Troubled Water," led by Heather Loughridge. Peter Dundee gave a short message afterwards and we served our guests afternoon tea. Joel reported that the event was a success, as some good conversations took place and quite a few CDs and Bibles were lifted as the guests left. 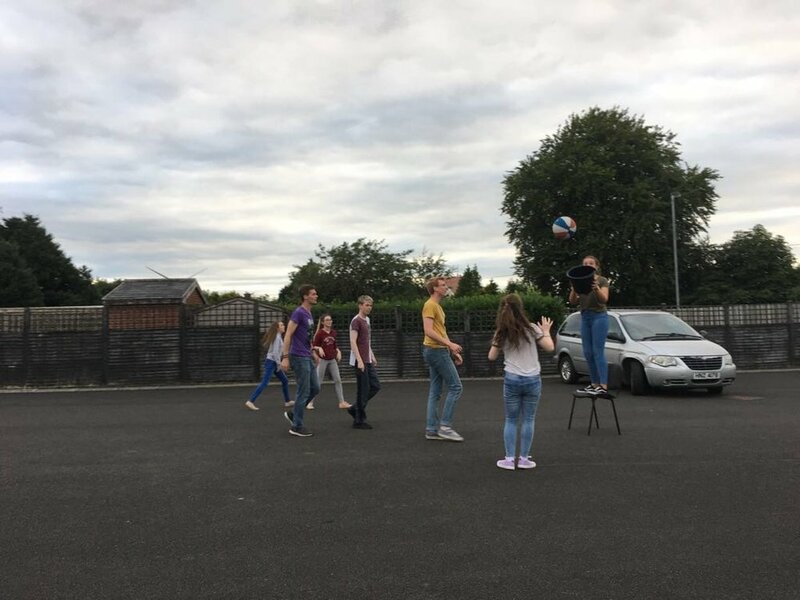 We enjoyed a barbecue hosted by the Forgrave family at their house in Ballymoney, then returned to the church for Youth Club. We had a slightly larger group this time for games, crafts, and baking. Elia gave the talk on the next part of the story of Esther. Afterwards we reflected on the day and prepared for Thursday. Prayers were answered today -- we had beautiful weather all day long! With the busiest day over with, we returned to the somewhat more relaxed schedule that we had on Tuesday. Linda spoke on Jesus and the way His coming solves the problem of sin, which the kids heard about Wednesday. For the final regular day of Holiday Bible Club, we saw the number of children sustained, with 48 today. We hope to see most of them with their families at our Fun Day on Friday morning! We were thankful to have a mostly uneventful week of club in terms of injuries and behavior issues. During the afternoon, after some naps, we met with Joel Loughridge and Peter Dundee, diving into theological questions about God's grace and having a time of prayer. Two things Joel has emphasized this week have been the theme of grace and peace presented in Sunday's sermon and the importance of public worship in the Christian life. Youth Club had a more casual activity of personal pizza-making, with the puddings from Wednesday for dessert. John gave a riveting telling of the final segment of the book of Esther. Like Holiday Bible Club, this was our last day of the normally structured Youth Club, but we will see some of them tomorrow when we travel to Ballycastle for a celebratory outing. The evening finished off with exciting preparations for the Fun Day on Friday morning. After that we will have a similar time of study in the afternoon before the Youth Club outing. It's hard to believe we only have one full day left! · Pray that the weather will cooperate for all our activities throughout Friday. · Pray that the many children who memorized John 3:16 at Holiday Bible Club will store it away in their hearts. · Pray that the "evidence folders" of Bible verses and worksheets that went home with the children will have an effect in their families and the community of Cloughmills. Ask the same thing in regard to the Bibles and CDs at the Tea Party. · Pray that the team will continue to experience the grace and peace of God as we work in harmony but on little sleep. · Pray that the Fun Day will be well-attended and well-executed. · Pray that we will have good conversations with the youth on our evening outing. · Pray for travel mercies for the team as they travel home on Saturday. This years team to Cloughmills consists of eleven members from as far as Washington DC, USA. They are: Thomas Jemphrey, Rachel Jemphrey, Elia Martin, Liam Martin, Jessica Muir, Georgie Allen, Ieuan McDonnell, John McCullough, Laramie Carey, Nathan Nelson and Anna Murphy. Monday was spent setting up the church for the Holiday Bible Club run for children during the day, planning activities and individual responsibilities and spending time as a team getting to know each other better through bowling and mini golf concluded with roasting marshmallows over the fire pit at the Forgrave’s home. 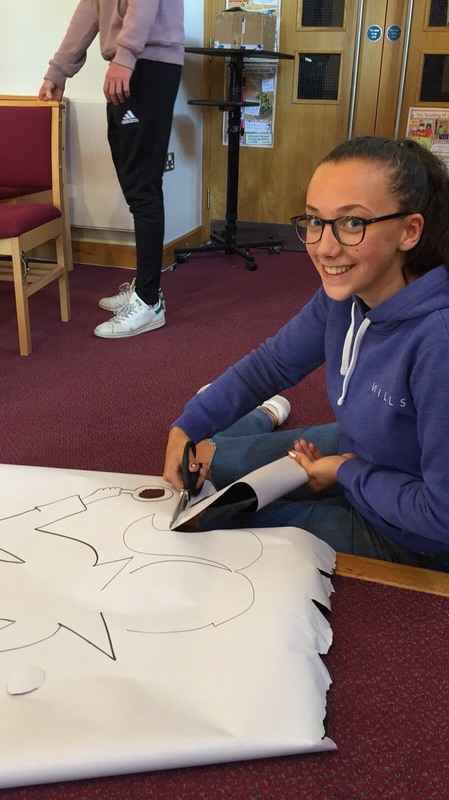 Tuesday saw the first day of the Bible Club happen, with a successful new format to teaching the children and a very high initial turnout with over 50 children. The evening youth club for teenagers also had its first day, with a lower than usual turnout of teenagers. Time was spent afterwards reflecting and singing as a team, as well as rehearsing different acts for the Pensioners Tea Party which takes place on the Wednesday. Please pray that the good weather would continue. Please pray for Anne, Linda and Andrea as they continue to lead the Bible Club as well as they have been and they would continue to plan the new format effectively. Please pray that there would be a higher turnout of teenagers in the evening. Please pray the children would take the message to heart and spread what they’ve heard with family and friends. Please pray for continued unity among the team and also that the team would grow spiritually through the Bible Studies with Joel Loughridge and continue to encourage one another in Christ while serving together during the week. Pray for other activities happening during the week - Parents & Toddlers on Wednesday morning, Pensioners' Tea Party on Wednesday afternoon & Fun Day on Friday. Give thanks for a good turn out at the Pensioners’ Tea Party on Wednesday afternoon. Martin & Mary Crossin, traditional Irish musicians and members of Milford RPC, performed a set, with some performances by members of the Go Team, including a rendition of Louis Armstrong’s ‘What a Wonderful World’. Joel Loughridge spoke at the end about how harmony in music as well as the relationships that give beauty in nature (such as trees of green and red roses) both point to the fact that true and lasting beauty, peace and joy are found in relationship with God. He explained how a relationship with God, through Jesus Christ is the essence of Christianity: "This is eternal life, that they may know you, the only true God, and Jesus Christ whom you have sent” (John 17:3). Both the kids and teens work continue to go well. Pray that as the teens consider the eighth, ninth and tenth commandments that they would be convicted of sin, shown Jesus as their only hope, and be instructed in how to live as Christians. Monday was spent getting ready for the Holiday Bible Club which will run from Tuesday until Friday. Please pray for good attendance at this and pray especially for Anna Coulter, Jess Muir, and John McCullough as they give talks. Pray that the congregation would have opportunities to build relationships with the families who come along. In the evening the team unwound by playing crazy golf and visiting Morelli's for ice cream. Give thanks for this time of getting to know one another and pray that God would help the team to work well together over the course of the week. Please pray for them as they get ready for the Pensioners' Tea Party on Wednesday and pray especially for Martin and Mary Crossin who will be coming to play music and for Joel Loughridge who will give a short epilogue.